BMT 03 is intended as a military long range anti-personnel rifle. Despite being a precision instrument the BMT rifle system is able to retain its functionality in harsh, operational environments. Variant 03 due to its extended effective range was designed as a counter-sniper rifle. A 5.56×45 mm NATO, air-cooled, direct impingement gas-operated, magazine-fed carbine. It has a 14.5 inch barrel and a telescoping stock. It is steadily replacing the most popular rifle in United States Army combat units as the primary infantry weapon. It's not just a pistol - it is a complete weapon system. It consists of a match grade semi-automatic pistol, a laser aiming module and suppressor. In 1990s Special Operations Command adopted this system for special operations units. Outstanding performance. This modern, gas-operated, semi-automatic shotgun is able to spit out incredible 30 rounds in just 8 seconds. Represents the ultimate mid-range stopping power. Dragoon SVD was designed as a squad long-range support weapon. It was selected as the winner of a contest that included three competing designs as due to its reliability and effectiveness. Pinpoint Strike Capability Rifle is intended as a military long range anti-personnel rifle. Despite being a precision instrument the PSCR rifle system is able to retain its functionality in harsh, operational environments. Variant A3 due to its extended effective range was designed as a counter-sniper rifle. 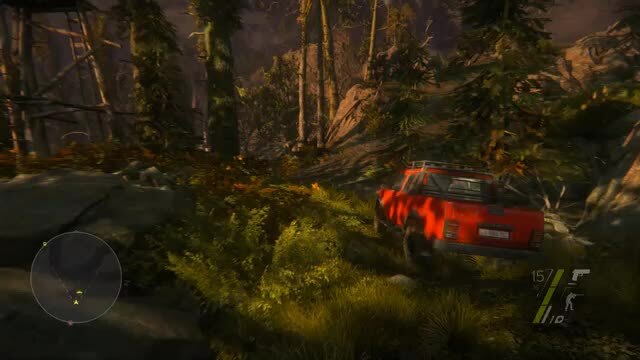 Players willing to risk using the open roads can get around quickly in an vehicle. This sweet set of wheels also serves as way to make a fast escape from the enemy territory. Enjoy the rush of speed as you traverse the breathtaking yet harsh off-road terrain. The invaluable Recon Drone is a high-tech scouting device that provides unparalleled assistance in exploring the surroundings in deadly Caucasus environment. Spot enemy patrols lurking through the countryside before they surprise you. Scout enemy outposts from a safe distance to prepare best tactic for the perfect strike. Expand your options by crafting mods that improve the drone's functionality. Detect hazards and structural weaknesses, hack computers and cameras from a safe distance and more! Utilize the friendly eye in the sky the way you want it! For the first time in Sniper Ghost Warrior history, the Player is thrown into a truly Open World environment. Open maps with multiple locations provide distinct background for a great number of unique missions. Traverse the deadly landscapes haunted by the ghosts of over 2500 years of conflicts and bloody struggles. Take part in a Sandbox Sniper Experience! Sniper: Ghost Warrior 3 © 2015 CI Games S.A., all rights reserved. Published and developed by CI Games S. A. Sniper Ghost Warrior 3 is a trademark of CI Games S.A.
Portions of this software are included under license © 2004-2015 Crytek GmbH. Crytek, CRYENGINE and CRYENGINE logos are registered trademarks of Crytek GmbH. © 2013 Valve Corporation. Steamworks and the Steamworks logo are trademarks and/or registered trademarks of Valve Corporation in the U.S. and/or other countries. The NVIDIA logo and the "The Way It’s Meant To Be Played" logo are registered trademarks, of NVIDIA Corporation. Copyright © 1997-2013 NVIDIA Corporation. All rights reserved. NVIDIA Corporation, 2701 San Tomas Expressway Santa Clara, CA 95050, USA. The depiction of any weapon or vehicle in this game does not indicate any affiliation, sponsorship, or endorsement by any weapon or vehicle manufacturer. "PlayStation" and PlayStation Network logo are registered trademarks of Sony Computer Entertainment Inc. Also, "PS4" is a trademark of the same company. "Blu-ray DiscTM" and "Blu-rayTM" are trademarks of the Blu- ray Disc Association.